This page, originally left blank, has been used for notes by later readers of the book, allowing us to trace much of its history. 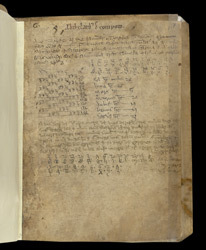 The statement of author and title in 13th-century script in the middle at the top ('Adthelardus de compoto') is recognisable as a Christ Church, Canterbury, inscription. Below this is a note of a flood in Thanet and Sheppy, in 1394, confirming continued ownership in Kent in the 14th century. The astrological symbol for Jupiter in the extreme top right corner is a characteristic marking of books owned by John Dee (died 1608), a famous alchemist in the court of Elizabeth I.